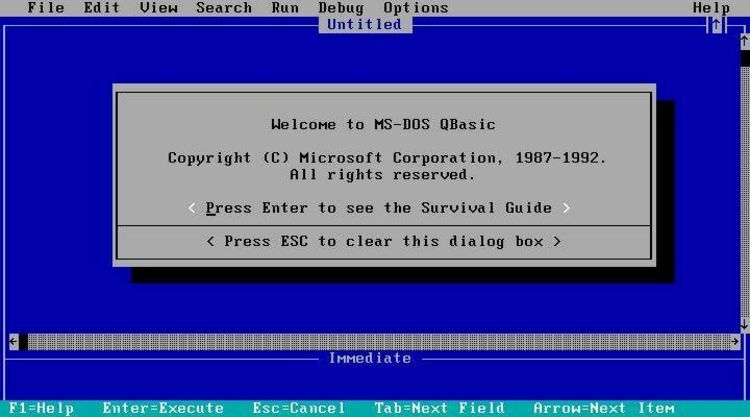 Microsoft application note for QBasic on how to use CALL INTERRUPT. to contribute, please mail them to the above address. Versions 6.00 and 6.00b for MS-DOS. INTERRUPTs using an array interface instead of user-defined TYPEs. useful to those who use QuickBASIC 2.00, 2.01, and 3.00. The CALL INTERRUPT statement is not supported in OS/2 protected mode. mode, with a few exceptions. 4.00b, and 4.50 and BASIC compiler 6.00 and 6.00b. will allow you to make CALLs to the routines in that Quick library. Quick library; in this case, it would be QB.LIB. 1. Metacommands are placed in comments (REM). 2. A colon (:) follows the $INCLUDE. 3. The filename (QB.BI) is enclosed in single quotation marks. INTERRUPTs use hexadecimal numbers rather than decimal numbers. must specify the low-order byte or the value will be stored as &H0001. the example section below breaks a register into the 2-byte values. PRINT "3rd Bit is on"
' /L option to load the default QB.QLB Quick library.
' you may find useful when CALLing INTERRUPTs.
' representing the high and low bytes of the original.
' binary string representation of the INTEGER. The CALL INTERRUPT and CALL INTERRUPTX statements are very similar. Either statement allows you to make calls to DOS and BIOS INTERRUPTs. necessary input and output by register.